The new complex is on Colchester’s Haven Road. 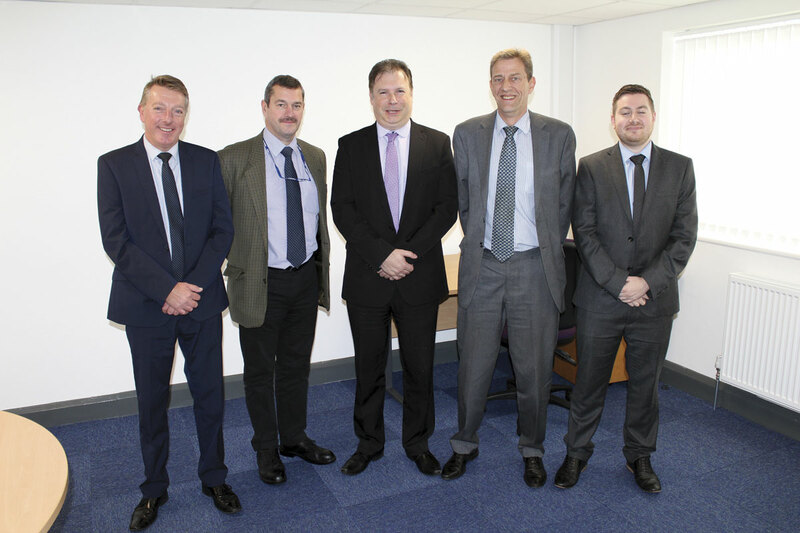 Colchester Operations Manager, Steve Hardman; Fleet Engineer, Chris Phillips; Network Manager, Julian Elliott; MD, Alex Jones and; Marketing Manager, Adam Keeble. A new six-bay workshop has been erected. The exterior of the new workshops with the cleaning bays nearest the camera. 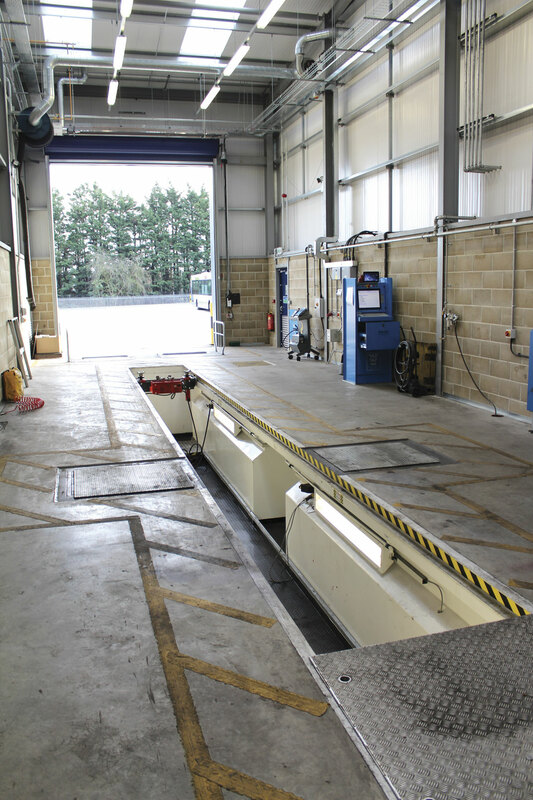 Fully equipped to DVSA standards, it is hoped the new MOT bay will receive authorisation for use as an ATF facility. Ten 2005 Volvo B7RLEs have been upgraded to Euro5 status and refurbished. The first of 17 new Wrightbus Streetlite Max Micro hybrids have been delivered to Colchester for use on the 61 and 65 services and all will be on the road by the end of the month. The arrival in Colchester this week of the first five of 17 new 11.5m Wrightbus Streetlite Max Micro Hybrid Door Forward buses is the second major investment First Essex has made in the town in recent months, coming close on the heels of the opening of a new depot. It is helping to transform an operation where there hadn’t been a huge amount spent in the previous decade or more. Stuart Jones met up with First Essex MD, Alex Jones, and his team at the new Quayside Depot to hear all about it and see for himself. In total, the new Streetlites represent an investment of £2.0m which is in addition to the circa £5m spent on the new depot (£3.5m) and travel centre. Officially opened at the end of September by Councillor Norman Hume, Chairman of Essex County Council and a former Transport Chair, in the presence of First’s local stakeholders, the new depot replaces the three facilities in the town used previously, creating massive efficiencies at all levels. Prior to it becoming operational at the end of August, the main depot and local headquarters was on Queen Street in the town centre where there was a workshop facility, but accommodating the fleet also required separate workshop facilities on Haven Road and parking in the run-down rented depot on Magdalen Street that had once been the home of Colchester Borough Council’s fleet. Previously, staff regularly had to wash and refuel the bus at one depot and park it at another. Coming off service at Queen Street had to be slick because otherwise the resulting line of buses would gridlock the town centre. Another barrier to efficient operation in the past was a Roman wall that ran through the Queen Street workshops. Subject to a preservation order, nobody was allowed to touch it. 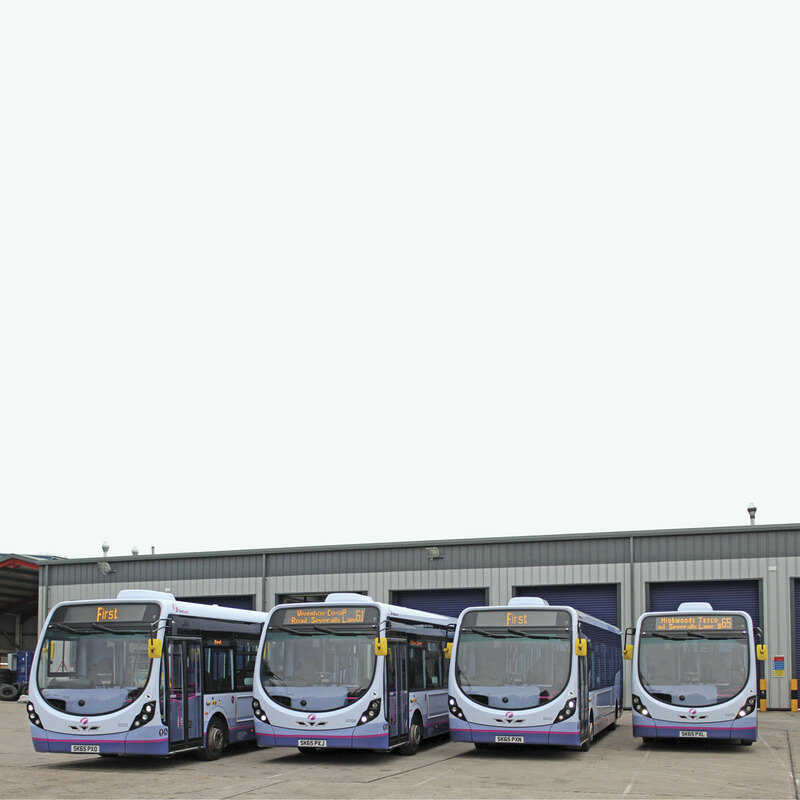 Of the total First Essex fleet of 350 buses and PVR of 314, First Colchester’s allocation is 72 buses with a PVR of 62. The depot has 182 drivers and 38 members of the engineering team including cleaners and engineering supervisors together with a management and supervisory team of seven led by Operating Manager, Steve Hartman. The route mix consists of seven town services occupying 40 buses and six inter urban services requiring the other 22. In addition, the town is served by services in from other depots. 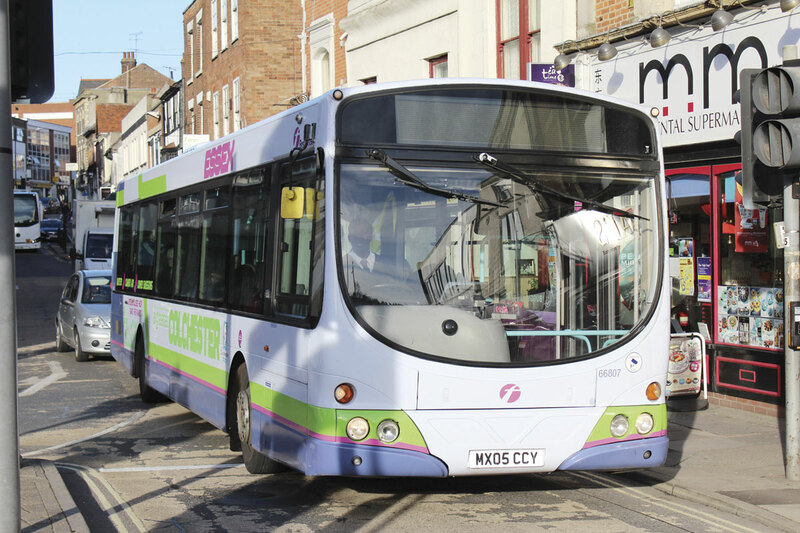 First is the biggest operator locally, though there is strong competition with Network Colchester (Arriva) and Hedingham Buses (Go-Ahead) as well as independents including Stephensons also represented. Originally part of Eastern National, the operation’s current fleet strength is at the top end of the number it has ever run, having been around 40 in the early 1990s. Fleet Engineer, Chris Phillips, showed me around the new site which is fronted by a refurbished two storey office block. 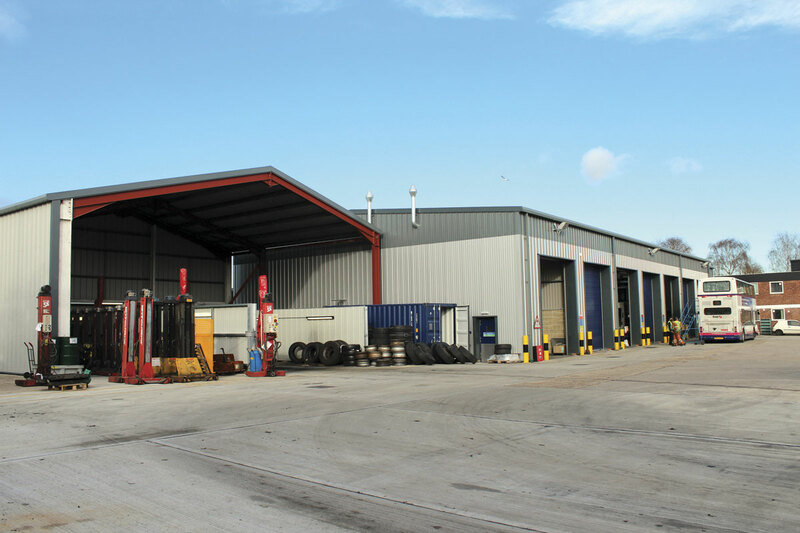 Formerly a timber yard, the 2.34 acre site has had a completely new engineering facility with a six bay main workshop erected and a seventh bay constructed alongside that is fully equipped to DVSA standards. Designed to be an ATF, it is envisaged that approval for its use as such will be obtained, hopefully in the New Year. 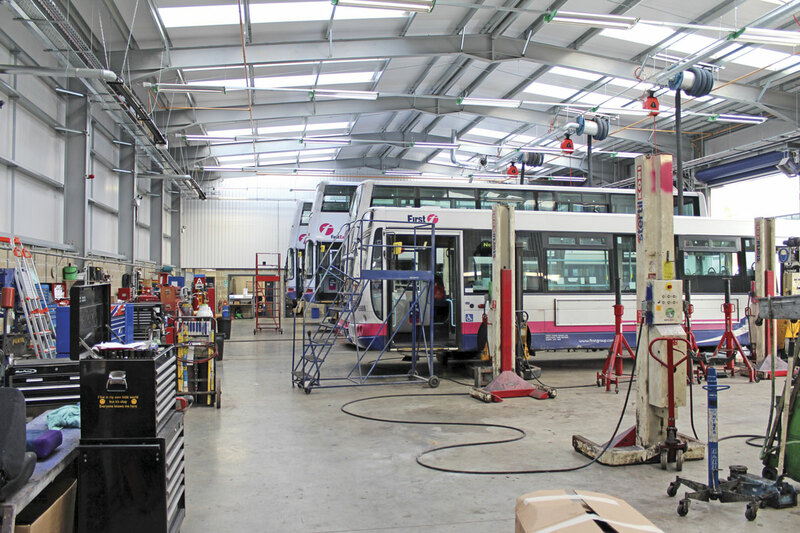 The main workshop has a flat floor and employs powered column lifts while the MOT bay has a pit supplied by Premier Pits and new testing equipment from VLT. Unifying the stores facilities on one site is making this aspect of the operation far more efficient. A separate open fronted shed alongside the workshops houses a steam cleaning bay and cleaning bays, though one of these is currently occupied by legacy lifting equipment awaiting dispersal. Arriving back at the depot, buses first pass through the refuelling facility to the left of the site which employs a Tri-Scan system and ‘totally enclosed’ tanks from Ledbury Welding. Beyond this is a drive through Karcher bus wash.
Alex Jones said at the time of the opening, ‘Our new centre of operations will help us improve upon our strong punctuality and reliability performance and provide us with an excellent platform to develop our business further’. It has been built to allow for expansion because the maximum capacity of the site is 106. 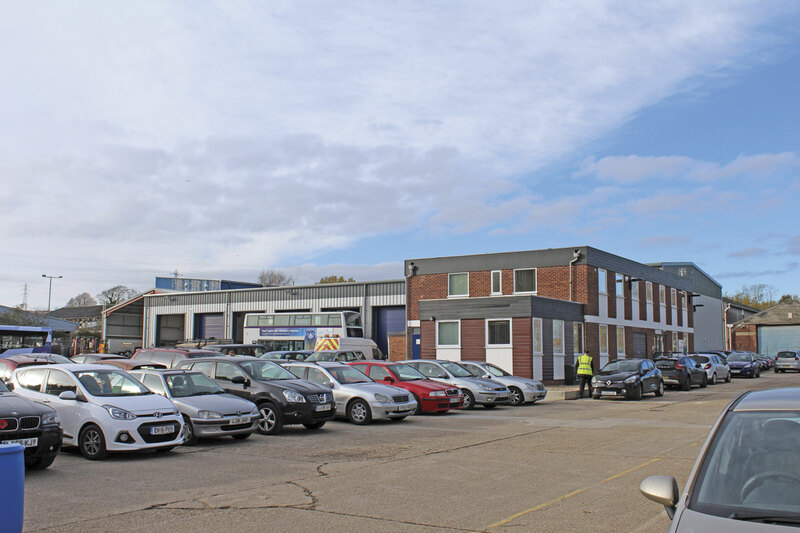 As well as the new depot, a bright new travel shop opened six months ago on a prominent site in the city centre just round the corner from the Bus Station and close to Colchester’s Town Station. It is a large building and while the front section houses the customer facing shop area, the larger rear area provides a comfortable new driver facility with canteen and recreation areas, as well as paying in facilities, the traffic controller function, a union office, a management office and a meeting room with hot desks. A dual sign-on system enables drivers to sign on either here or at the depot. A separate entrance is provided to the drivers’ facility to avoid the need to traipse through the shop where customers can buy not only First tickets but also other travel products including National Express tickets and Crusader Holidays. The travel shop, finished in the latest corporate style, replaces an existing travel shop and a very small driver facility that were part of the old Queen Street depot. Tickets up to and including the four weekly ticket can be purchased on bus, but season tickets for longer durations have to be purchased at the travel shop or local agencies. Currently, an unusually high proportion of revenue in the area is collected on bus. Network Manager, Julian Elliott explained that on-bus transactions account for two thirds of non-concession fares, something that creates boarding delay issues on Mondays when people want to renew season tickets. Smart options are being looked at with the local council. Already starting to take off is M-ticketing using smart phones. Marketing Manager, Adam Keeble, said that it had been widely promoted on the Heart local radio station, with the appearance of ‘Heart Angels’ on peak morning buses offering quick wins, on bus advertising and a concerted on line and social media campaign. As a result M-journeys have doubled from 6,000 a week to 12,000 since this started with the most popular M-ticket being the 12-journey ticket, though this remains a very small percentage of total passenger journeys. The new Streetlites are replacing 17 non DDA-compliant buses dating from 1998-2000, all of them Wright bodied and the majority on Scania L94 chassis, though some Volvo B10BLEs will also go. Earlier this year, two new 10.8m Euro5 powered Streetlites from an order for 16 arrived in Colchester, though these will now join seven other members of the batch in Basildon. They were thought to have been the first brand new buses allocated to Colchester since around 2003, though there have been late pre-used arrivals within that period. The latest 17 Streetlites, all of which will be in service by the end of November, bring to 53 the number of Streetlites in the fleet, as 20 were delivered last year to Hadleigh, which also received seven of the earlier batch this year. They mark a significant improvement in the customer offering as all are equipped with E-Leather seating, Wi-fi, CCTV, additional head and leg room and Euro6 engines. Over a quarter of the First Essex fleet is now Wi-fi equipped. The capacity of 41+33, 35+39 or 35+38+one wheelchair compares well with the non DDA Scanias being withdrawn which offered 40+29, 34+39 or 34+33+1. The Euro6 engines mark a big step forward for the fleet in emissions terms. Colchester will be using the Streetlites on two services. The 61 runs from Wivenhoe and the University of Essex to the south east of Colchester, through the town via the station and hospital to Highwoods in the north. The 65 goes from Stanway to the west of the town through the town centre via Lexden Road, the station and hospital to Highwoods. Both the 61 and 65 routes were revised at the beginning of November so direct comparison will be difficult but passenger growth is being targeted with at least 5% hoped for from the investment, bringing with it a significant uplift in quality. Colchester is a rapidly growing town, on top of which the local student population is also increasing. The number of students at the University of Essex has risen from 12,000 to 14,000 this year and is set to rise to 17,000 by 2017. Students are offered a variety of discounted options under the Unicard brand, of which that giving unlimited travel in the Colchester urban zone is the most popular. Aside from the Streetlites, the majority of buses are single deck but there are also 18 double deckers made up of four B7TLs for the 70 (that Colchester runs with Braintree and Chelmsford) and 14 former London Dennis Tridents that underwent mid life refurbishment and conversion to single door in 2012. There are still quite a number of Wrightbus Volvo B7RLEs including seven Euro4s with 58 plates. Ten 2005 B7RLEs have been upgraded to CVT (Clean Vehicle Technology) specification (equivalent to Euro5) with electric fan systems from Avid and new Eminox exhaust systems. Carried out in conjunction with Colchester Borough Council, the work included interior refurbishment and retrimming in E-Leather. These buses are distinguishable from other outwardly similar buses because they carry a revised livery blending green with the latest corporate colours. Apart from the 53 Streetlites, other major vehicle investments across the group in the last two years include 19 Volvo 7900H hybrids allocated to Basildon for use on the 100 between Chelmsford, Billericay, Basildon, Grays and Lakeside. Four ADL Enviro350H hybrid single deckers have also gone into service at Chelmsford where 15 Enviro200s were delivered in 2013. The First Essex website has recently been refreshed and was one of the first to be thus treated using the standard First template. It incorporates journey planning with maps and feeds of the Traveline system. There is a facility to download timetables. Another feature is an improved Content Management System (CMS) that allows the team to get information onto the site almost immediately because they have full local control. It can also link into social media feeds so that customers can see important information quickly, even if they do not follow twitter or Facebook. The twitter account is @firstessex whilst that for Facebook is firstessexbuses. Alex revealed that the company has had an approach from rail operator C2C about a bus add-on to their rail season smartcard, which would be an extension of the PlusBus concept. Apparently, people frequently attempt to use Oyster cards to pay for journeys, especially in South Essex, but also in Colchester. Every bus is now equipped with new Vix ticket machines linked with the Horizons viewer. The company is working with Essex County Council to show realtime passenger information again. First’s own App is very close to launch and the system is already being used to regulate routes. It provides a full live tracking feed and has a text facility through the machine to communicate with the driver. It was explained that Essex had had realtime information but since funding for it ran out this had only shown at stop departure times. The council is now working with the suppliers to recommission it so that real time information will be available at stops as well as via the First App. ‘We’ll be just like London (except that you can’t use Oyster)’ said Alex. Alex was pleased with what had been done and upbeat about what could be achieved in Essex in the future. He believed that there had been a transformation over the last two years with key KPI indicators improving. In terms of customer satisfaction, they had been at 100 and were now at 106 which was one below the UK norm. Driver behaviour was another indicator that has taken a big step forward.